United Neighborhood Centers of Northeastern Pennsylvania (UNC) recently received a $1,000 donation from FNCB Bank to support the agency’s educational programs of Project Hope. Project Hope gives UNC the opportunity to provide youth (aged 5-12) from low-income families with a traditional summer day camp experience. The camp is hosted at Camp Kelly in Tunkhannock, PA, and campers are provided with transportation, and also served breakfast, lunch, and a nutritious snack before returning home. Arts and crafts, sports, and supplemental tutoring activities are all on the agenda to make the experience both fun and educational. 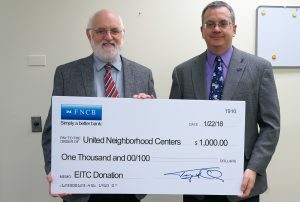 Pictured at the check presentation are (left to right): Michael Hanley, United Neighborhood Centers CEO; and Michael Cummings, Assistant Vice President and Marketing Manager at FNCB Bank.